I apparently took too long in between the tissue alterations and the dress fitting because I managed to lose a tiny bit of weight. It’s smart to always use the same undergarments you’re going to use with your dress during the whole process but how can you anticipate nursing related weight loss. Not much, but enough to necessitate taking in the bust area. Below you can see how much excess I’m having to take out. In the next photo, you can partially see how nice the fit in the back turned out. The pattern was altered for a short waist- a must for me, and it paid off. Ignore the little peek of skin in the side seam. It’s been fixed since this photo was taken. I’ve also taken in the dress in the front to better follow my curves. 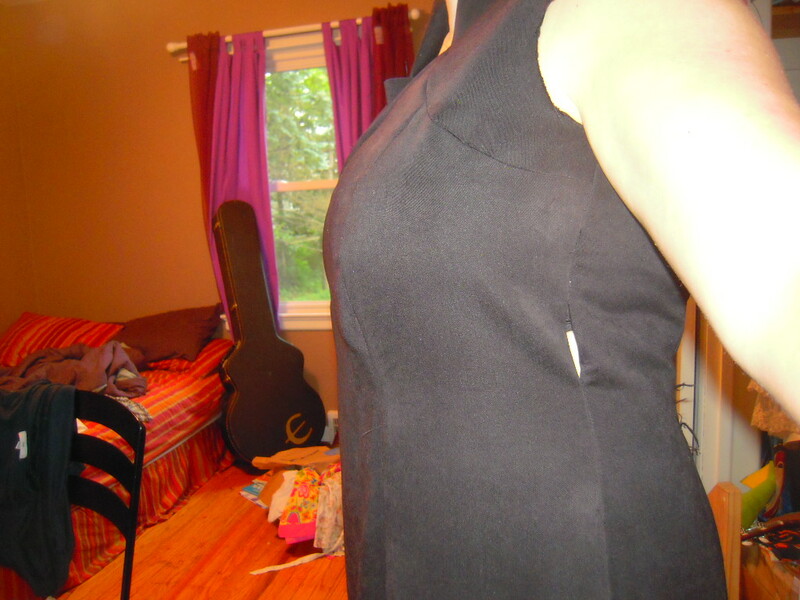 Currently, the dress is fitted but not skin tight. The biggest thing I’m learning is about the lowering of the apex. Remember that when you lower the apex, you might also have to taken in the area just above the bust. 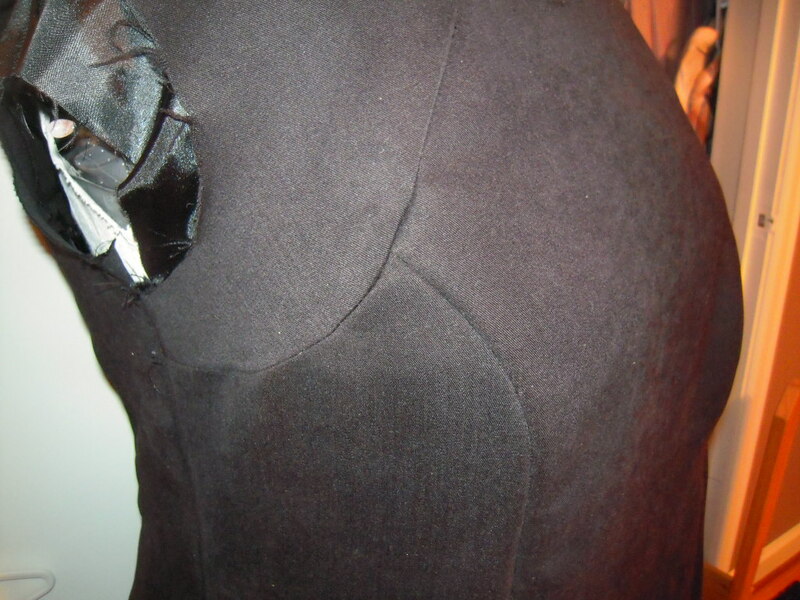 The fullness in my case is due in part to the FBA (full bust adjustment) I made months ago on the tissue. When I went back to the tissue, I discovered exactly why I had excess fabric where I did. I’ve taken in those areas and am going to cut one new piece- the arm yoke (is that a term?) 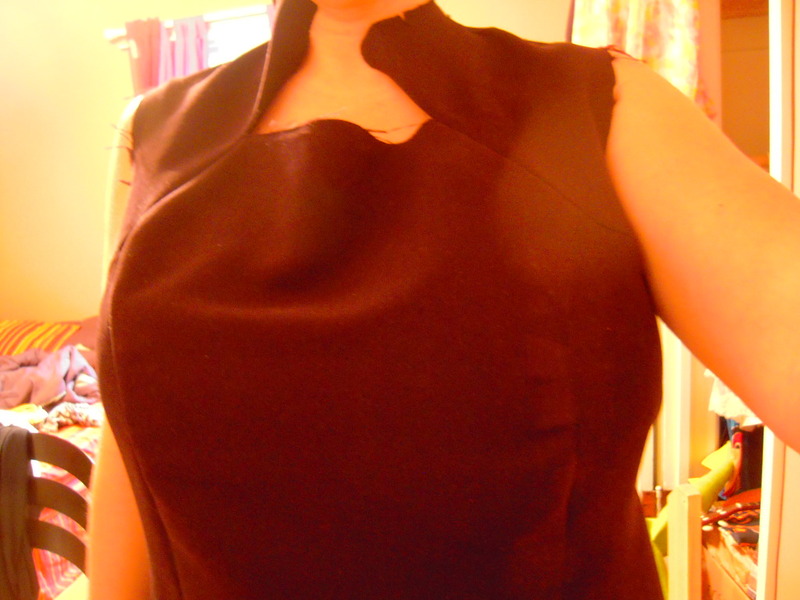 that curves from the shoulder seam down the front and then under the armpit. 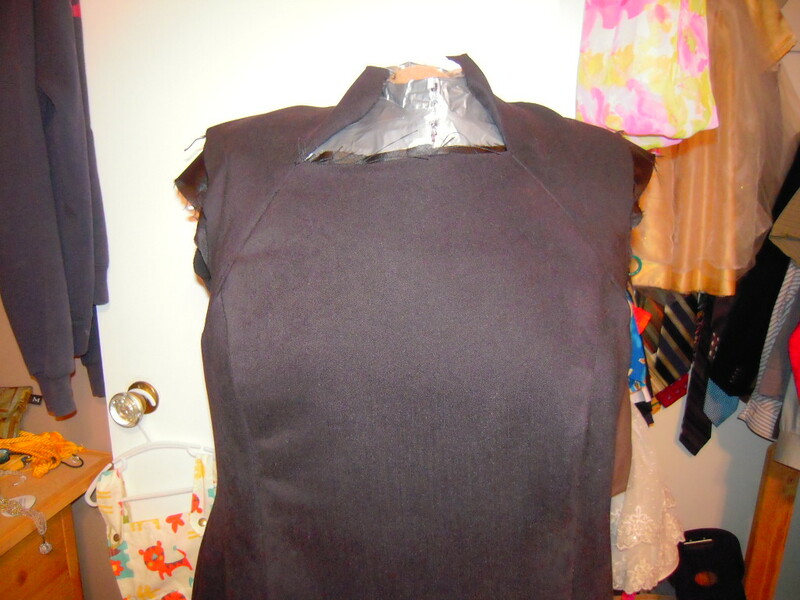 I’ll also have to cut a new “arm yoke” piece for the lining. I still have to pull all the important pieces apart so I can attach this new piece. It should run smoothly. It’s a good thing I’ve got so much of this material. This process isn’t meant to take long. It’s just that I take care of my two kids during the day and I’ve been so tired at night I mostly just pass out when I’m putting them to bed. So, yeah. More work but I think I’ll be really pleased with it in the end. Can I just plug tracing your pattern onto another paper/pattern paper before you alter it? I didn’t and I’m really wishing I had taken the time. It would also work to buy your pattern when (or if) it goes on sale and just get two so you can trash one of them. Maternal weight fluctuations are the most frustrating part of garment sewing for me. I think that is why I have steered more towards knit tops. I was thinking I needed to lower the apex of a dress i was working on, but I found if I use the correct size in my shoulders (a 14/16) and let out the bust to fit, it lowered the apex for me. Hooray. Of course, I just did a quick muslin and I won’t see how it all comes together until I sew the real deal. Hopefully today. I’ll post pictures of my altered pattern, I would love to get feed back from more experience pattern adjusters about how I did it. Thanks for the comment, Jodi. I was working with knits a lot and I think I got burned out. Maybe I just haven’t found the perfect knit to work with. That’s probably it. I’m actually curious about what you say regarding lowering the apex. I wonder if I didn’t need to lower the apex on this dress after all, though when I tried on the tissue it did look like I needed to lower the apex, even when using the size according to my shoulders. I have really narrow shoulders, so there’s quite a bit to alter. I wonder if I have it in me to start the FBA from scratch. Maybe not now. I think I’ll turn to draping something now instead. I tend to have better luck with draping. I’ll look out for your alterations post.